Carly Rae Jepsen’s insidiously catchy “Call Me Maybe” isn’t just a number one single. The song has become a full-blown pop-cultural phenomenon, inspiring memes, viral videos starring everyone from Justin Bieber to the Harvard baseball team, and faithful covers by artists like fun..
From this mass of giggles, giddy dance moves and exuberant singalongs, one particular cover has emerged from the crowd. Haunting, pensive and delivered with just a little bit of a smirk, Ben Howard’s take is a very different beast. Even the motivation behind the British folk singer’s take on “Call Me Maybe” is more like an experiment than straight tribute. Faced with a list of pop songs that they could cover as part of their appearance on BBC Radio 1’s Live Lounge, Howard and his band simply picked the least offensive. While evocations of satan and hell aren’t the most flattering things that have ever been said about Jepsen’s epic earworm of a hit single, Howard is quick to point out that he thinks it’s a genuinely good tune. It’s just not something that you’d ever find in his own personal record collection. Oddly, it was the singer’s lack of attachment to the source material that really makes his version of “Call Me Maybe” what it is. It allowed him to play around with the sound and feeling and make it his own in a way that he really couldn’t with a piece of music he genuinely adores. 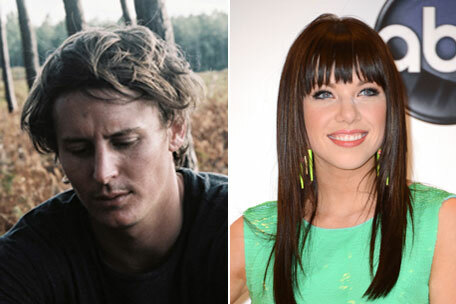 Another song that he considers untouchable is Joni Mitchell’s “Both Sides Now,” a version of which just so happens to appear on Carly Rae Jepsen’s Curiosity EP, right alongside “Call Me Maybe.” Howard has heard CRJ’s popped up take on the Canadian classic, and he can’t say that he’s a big fan. Howard finds the cover so distasteful that it makes him question Jepsen’s folk rock roots. “If she was a Joni Mitchell fan, then surely she wouldn’t have touched that song,” he says. Luckily for Ben and his crew, the public’s response to his own cover have been far more favorable. Pop and folk fans alike have taken to the song, making it a minor viral sensation. The singer is more amused than anything by the response. Recently converted North American fans will have a chance to see the folk artist in the flesh when he returns for a more extensive tour of Canada and the U.S. this fall. After an impressive first round of shows on this side of the Atlantic earlier this year, he’s eager to come back. And if karma happens to pay him back in the form of a bunch of Canadians and Americans covering his music, Howard is ready. It’s already started to happen across the pond. This story originally appeared June 4, 2012 on the AOL Spinner website.